I’ve fallen behind on anime recently. I’m not sure if that’s down to a lack of interest in what I’m watching or if I’m just not in the mood for anime at the moment, but I’m feeling quite ambivalent about it all. In Celeste’s latest post, she shares the idea of “sticky anime,” positing that certain anime seem to stick with us in an emotional sense, and that others, well, don’t. They are forgettable. Forgettable anime is a subjective thing, of course. It’s as much about circumstance and taste as anything else. So, for me to say I’m finding most currently-airing anime to be forgettable isn’t as much a comment on this season’s quality as my own indifference to it all. I’m enjoying anime like Mawaru Penguindrum, Tiger & Bunny and Steins;Gate, but they aren’t affecting me. I’m watching these series because I’m an anime fan and that’s what I do, I watch anime, but it’s now more of a routine than a deep fascination for the medium. Last night, I watched Porco Rosso for the first time. 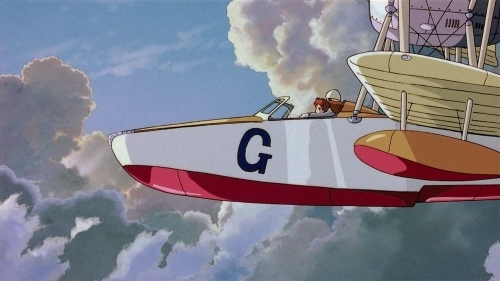 It’s a Hayao Miyazaki film about a flying pig. To be more specific, it’s about a World War II-era Italian fighter-pilot ambiguously cursed with the face of a pig. The ace in question is Porco Rosso, an easy-going kind of guy. He quit the air-force after the First World War and now works as a kind-of mercenary, battling against sea-pirates and drinking red wine. 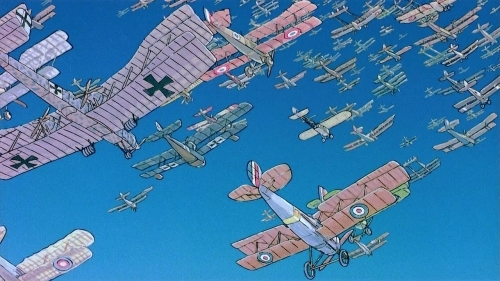 Quite clearly, then, this isn’t normal fare for anime, not even for Hayao Miyazaki. For one, the main character is a world-weary, pig-faced, middle-aged man, so that this even got made is something of a miracle, but then, upon starting it, one senses how passionate a project this must have been for the famous director. It’s also a film I identified with from the off. Porco Rosso is about people trying to live happy lives, how time and place changes everything, and about freedom. The freedom of the skies over the Adriatic Sea, and how the best thing in the world is being able to wake-up every day knowing that you’ll be able to work hard doing what you love. It’s so ostensibly carefree and in love with flight, yet feels so nostalgic, melancholy even. It depicts a paradise lost, a fleeting era of adventure soon to be swallowed by fascism and war. 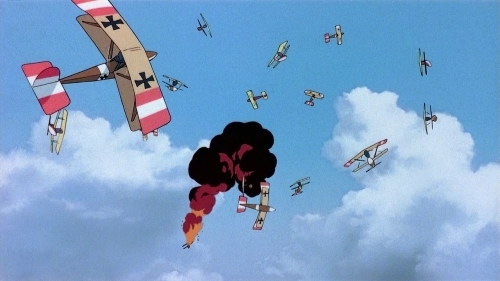 Porco’s trapped in a kind-of purgatory, his love for flight corrupted by the loss of his friends to pointless war, all depicted in a beautifully animated, surreal scene of aircraft clashing in blue skies, dancing in combat like moths to a flame. Lives lost so beautifully, Porco’s the only survivor, a bitter-sweet thing. We’re seeing the world through his eyes, knowing that these days of relative peace are so fragile. Before we even come to understand his character, there’s a feeling of nostalgia to this that’s revealing. It’s a film based in the real world, yet feels like a romantic fantasy. These are the days I yearn for, perhaps, but like Porco, I’m not sure I could truly let go. A fantasy is not real, and there’s always a point when the time comes to wake-up, a bubble waiting to be burst. The people of Porco Rosso‘s world live in a kind of isolation, and it can’t last. I needed to watch Porco Rosso. This is usually where I’ll say something like I regret not watching it sooner, but in the spirit of sticky anime, I’m glad I watched it when I did, at this time and place. You’ll find it when you need to, like I did. I found it, six months ago. Thanks for putting into words pretty much everything I felt about the movie. It is absolutely wonderful, one of Miyazaki’s best. Great film. I should really see it again. For quite a time it was my favorite of Miyazaki’s. I’m also with you re the timing of one’s viewing. I recently just finished Infinite Ryvius which I had put off for more than a year. When I did watch it, it felt like the perfect time to do so. I love Porco Rosso! It takes me back to my childhood days of reading Roald Dahl’s autobiographical books. I watched in a Studio Ghibli marathon three years ago, and I liked it the most out of what I saw. 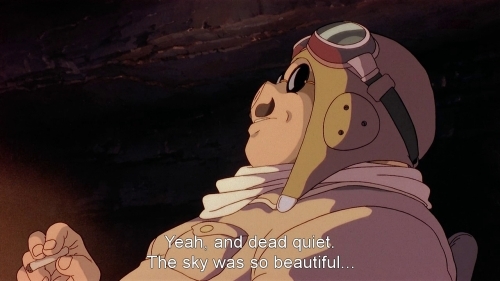 Yup, I’m gradually working through Ghibli’s stuff and Porco Rosso is surely up there with some of their best, along side Only Yesterday, Princes Mononoke and Nausicaa. I really like it when they put out more adult-orientated films, and wish that Miyazaki would have another try at something like this. I’ve always wondered where the tension between him and Mamoru Oshii came from, but looking at Porco Rosso, that one surreal scene I’ve described above reminded me of Oshii’s more philosophical moments in Patlabor. I remember I told you before that Porco Rosso was one of my favorites from Ghibli. I am glad you saw it and enjoyed it. As for this season’s anime I am the opposite than you. It’s been awhile since I have enjoyed so many anime: Mawaru Penguin Drum, Usagi Drop, & more Natsume Yuujinchou are all wonderful to me. This season doesn’t feel particularly bad, it’s just… I’m out of it at the moment. I’m watching too much and feel a bit overwhelmed by it all, so next season, I’m not planning to pick-up much at all. Spot on write up, Porco Rosso is up there contending with Princess Mononoke as my favourite Ghibli film. It’s such an unlikely setup, combining fairytale with historical realism and yet its completely immersive! I’m glad you highlighted THAT scene aswell; a completely breathtaking moment. I’ve seen Arrietty too, and totally agree. I loved it, particularly the first half. I’m having something of a Ghibli love affair at the moment! 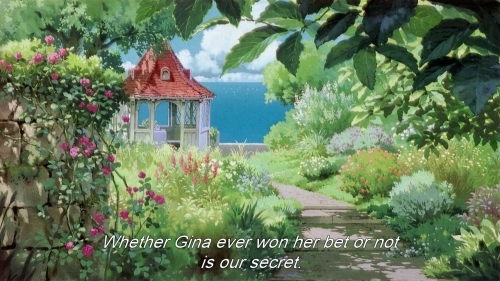 So far I haven’t found a Ghibli film I haven’t loved. One of my all time favorites is grave of fireflies but I haven’t seen a cloud prairie yet I’ll have to pick it up and watch it when I get a chance sometime this week. From your review I can tell it sounds like its going to be really good and worth watching. Beautiful commentary on a beautiful film! You really captured the feeling this picture exudes. I’ve never thought of it like that before, but it makes total sense. 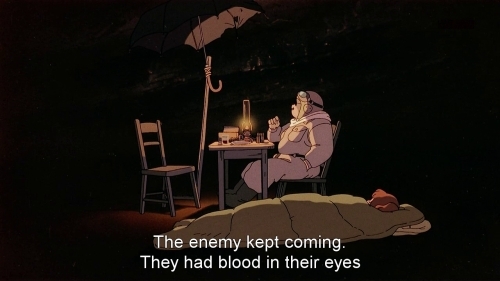 It’s this melancholy that really uplifts Porco Rosso and heaves it into the league of Miyazaki masterpieces rather than nice but mediocre films (IMHO, that is, of course).